Gazpacho is a chilled soup everyone should learn to love. Gazpacho, by definition, is a soup made with raw vegetables and served chilled. Gazpacho is believed to have originated in the Southern Spanish region Andalusia, but is commonly seen all over Spain and Portugal (where it is known as “Gaupacho”). Historically, the most well-known versions of gazpacho (or “soup-salad” as it has been called) come from Seville and Córdoba. Traditional ingredients were simply a mixture of breadcrumbs, olive oil, water and vinegar–blended in a mortar. Over time, closer to the 19th century, peppers, cucumbers and tomatoes got incorporated. Ingredients, texture, and thickness of gazpacho continue to vary regionally. 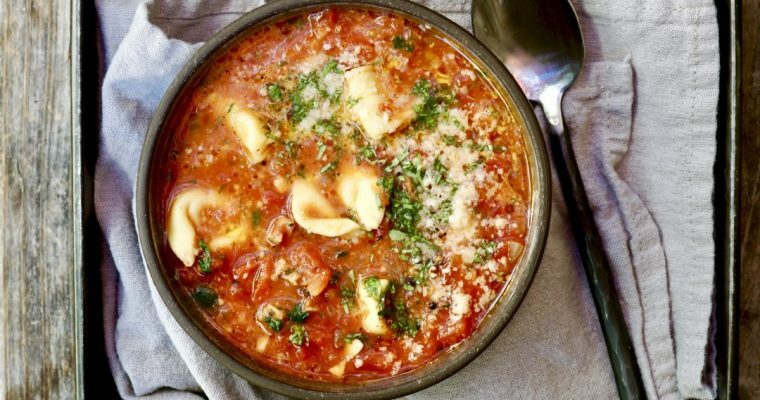 For the most part, gazpachos are classified by color: the most common one being red, which contain tomato; white ones , which contain no tomato, but often include dried fruits; and green ones, which start white but contain some spices that make them green. All of the red gazpachos have core ingredients in common. Gazpacho is a rather versatile soup overall, it can be served as a starter or main dish, and makes an extremely healthy snack. My love of gazpacho began in Portugal and was confirmed in Spain, somewhere around 2001. The specifics are hazy now, I can’t remember the special places I went to eat. But I remember having gazpacho almost everywhere I went. It was incredibly hot during that trip, and that probably explains why I consumed so much chilled soup. 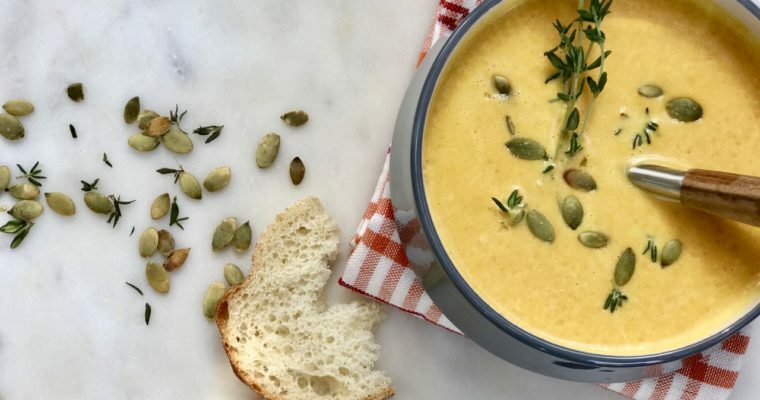 While cold soup does not sound entirely appealing to me in concept, there I realized it can be delicious, refreshing and earthy. 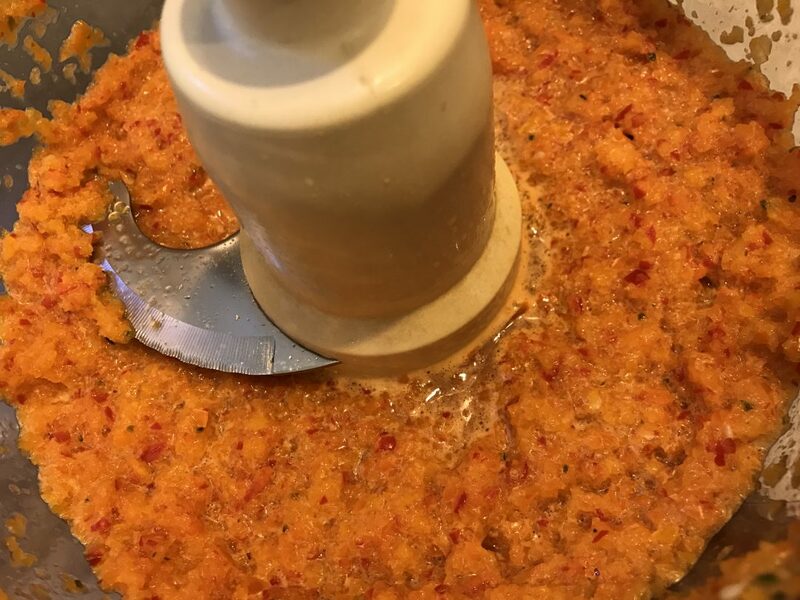 With good gazpacho, the vinegar enhances the tomatoes and sweetens the peppers. It is thick and hardy, not watery. It is smooth and filling, not chunky. The recipes were different everywhere I went, but they all succeeded in layering flavors, enhancing ingredients. My very favorite version came in Seville, just before I returned home. This recipe made like traditional gazpacho, with old bread puréed into the liquid, was more pink than red. It was garnished with finely chopped egg. To this day, I can not replicate that version. Maybe I need to return to Seville to enjoy it there, where gazpacho is truly from. Below is a version of gazpacho I came up with about 10 years ago when I first began cooking with my boys. This is a clean, simple and easy version that is fun to make with children. I began making this to encourage my kids to eat more vegetables. I don’t believe in hiding vegetables in foods, or tricking your kids into thinking they are eating something else. Children need to learn to like vegetables for what they are. I believe if you continually expose children to vegetables, they will learn to like the flavors and textures eventually, even brussels sprouts. A good presentation won’t hurt either! 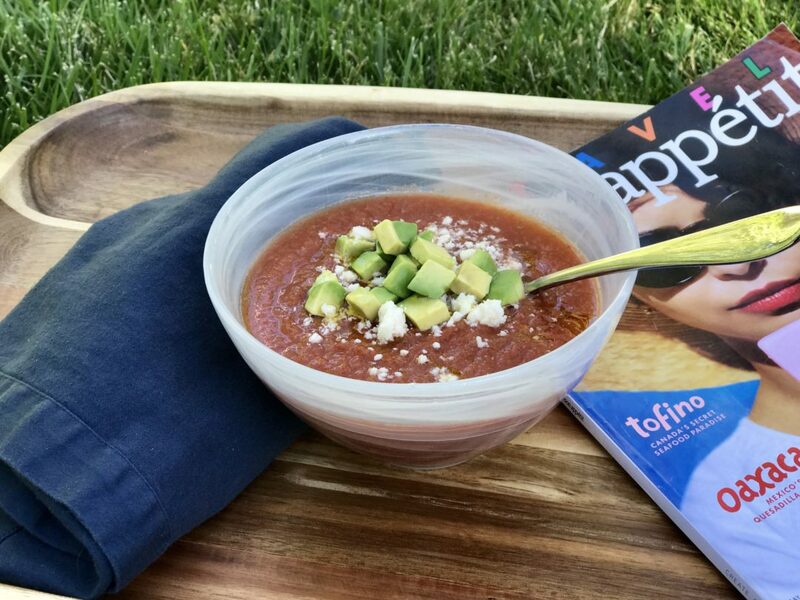 My gazpacho is a quick version that does not even require fresh summer tomatoes. You can make it with good quality canned ones, for simplicity. The V8 got added because my older son went through a phase of loving it, and so we experimented one day by adding some. He had a good palate even than, and V-8 has become a permanent ingredient ever since. Step 1 Slice mini peppers in half and discard stem and seeds. 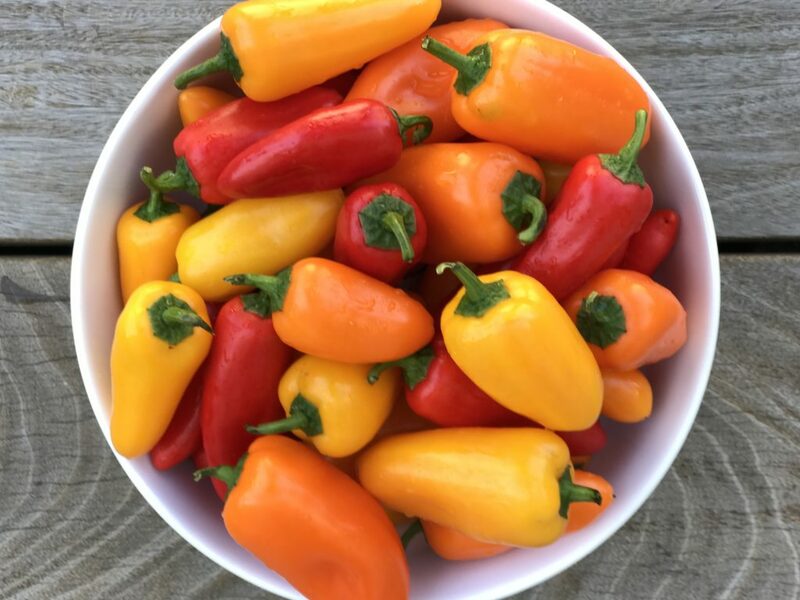 Place peppers in a medium mixing bowl and set aside. Step 2 Peel the cucumbers and slice in half lengthwise. Using a teaspoon, deseed each cucumber. Rough chop the cucumbers and place in a second larger mixing bowl. Step 3 Rough chop the red onion and add to the cucumbers. Step 4 Using a Cuisinart fitted with a chopping blade, add the cucumbers and onion and purée. Place mixture back in the mixing bowl it was in before, and set aside. Step 5 Add the peppers to the Cuisinart and pulse until finely chopped. Add to the cucumber mixture. Step 6 Place the tomatoes, V8, olive oil and balsamic vinegar in the Cuisinart and purée well, about 1 minute. Pour the tomato mixture into the large mixing bowl with the other vegetables. Step 7 Using a large wooden spoon, mix the soup well. Add salt. Adjust seasoning as needed. More balsamic vinegar can be added for a sweeter taste, more salt for a saltier more tomato-enhanced taste. Step 8 Chill gazpacho until ready to serve.